1 Approval number 2 Manufacturer's serial number. 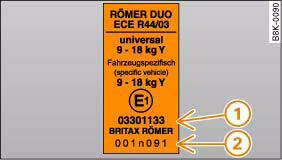 The label also shows information on the use and weight class of the child seat. A child safety seat can be secured on the rear seats and on the front passenger's seat. The following alternatives are available for safely securing a child safety seat on the rear seats and on the front passenger's seat. • Child safety seats of the categories 0 to 3 can be secured with the standard three-point seat belts. • Child safety seats of the categories 0, 0+ and 1 with the “ISOFIX” system can be secured without seat belts using the “ISOFIX” retainers*. a The front passenger's backrest must be set as far forward as possible or adapted to the child safety seat as required, and the seat height must be adjusted to its highest position. b The front passenger's airbag must be deactivated if a rearwardfacing child seat is used. c The front passenger's seat can be equipped with optional “ISOFIX” retainers. 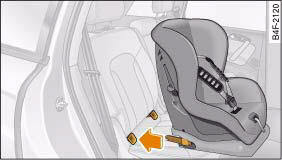 d The rear seats can be equipped with optional “ISOFIX” retainers. While the vehicle is moving, children must always be protected with a restraint system which is suited to their age, height and weight. Please refer to the chapter “Child seat categories”. • Never install a rearward-facing child safety seat on the front passenger's seat unless the front passenger's airbag has been deactivated. This could result in potentially fatal injuries. If you have no alternative but to let a child travel on the front passenger's seat, the front passenger's airbag must be deactivated beforehand. Please refer to the chapter “Deactivating airbags”. • Note the important information and warnings concerning the use of child safety seats found in the chapter “Important safety notes when using child safety seats” and in the installation instructions provided by the manufacturer of the child safety seat. Child safety seats with the “ISOFIX” system can be secured quickly and easily. The ISOFIX child safety seat is pushed into the protective sleeves. When removing or fitting the child safety seat, please be sure to follow the manufacturer's instructions. – Fit the protective sleeves A onto the retainers B between the backrest and the seat cushion, fig. 231. – Push the mountings on the child safety seat into the protective sleeves until they engage audibly (2x), fig. 231. – Pull on the child safety seat to check whether both catches have engaged properly. Child safety seats with the “ISOFIX” system can be secured quickly and safely on the rear seat* or on the front passenger's seat*. Detailed fitting instructions are supplied with the child safety seat. Child seats with “ISOFIX” mountings are available from Audi dealers and specialist retailers. If required, the “ISOFIX” mounting system can be retrofitted. The retainers used here are specially designed for child safety seats with “ISOFIX” mountings. Do not attempt to secure other types of child safety seat, seat belts or other objects with these retainers – this could result in serious or possibly fatal injury.